Highland Council is to examine how it can make £750,000 in savings in classroom support provision across its primary schools. Plans to axe classroom assistants posts and replace them with a lower number of new learning support auxiliaries were scaled back earlier this month. The proposal led parents on Skye to take their children out of school early in protest at the move. The council has proposed setting up two groups to help identify savings. 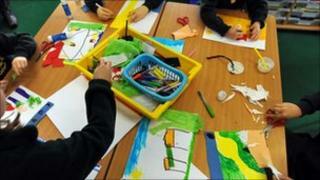 A cross-party review group would look into the classroom support needs in primary schools. It would make recommendations on the future shape of support, after taking into account pupils' educational, social and emotional needs. A task group could also be set up to write reports for the review group's consideration. The proposals will be considered by councillors next week. Earlier this month, Highland Council agreed to reduce the level of savings from £883,000 to £319,000 during 2011-12. The two groups would investigate how £751,000 might be saved during 2012-13.